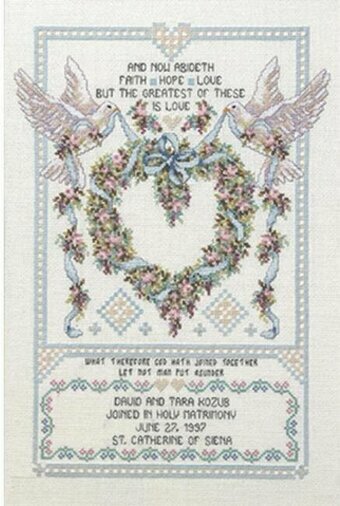 Kit includes 18 Ct. Ivory Aida, felt, needle, thread and instructions. Finished size: 4 1/4" x 4 1/4". Model stitched on 30 Ct. Straw linen with DMC floss, Crescent Colours, and Gentle Art Sampler threads. 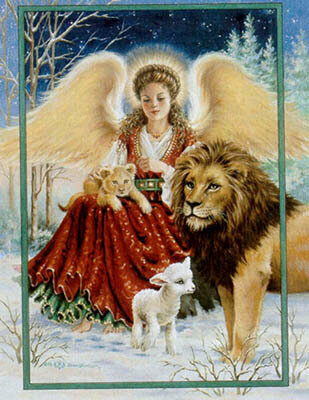 DMC conversions are 898 712 3865 433 434 936 221. Stitch Count: 42W x 63H. 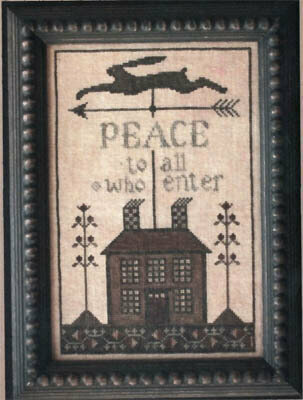 "Peace to all who enter." Model stitched on 30 Ct. Straw linen with Weeks Dye Works floss (or DMC 730, 829, 801, 3371, 646, 370). Stitch Count: 98W x 153H. 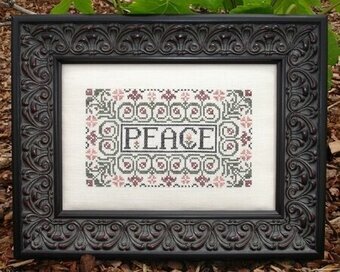 Model stitched over two threads on 36 Ct. Regency by Picture this Plus using Gentle Art Sampler threads & DMC floss. 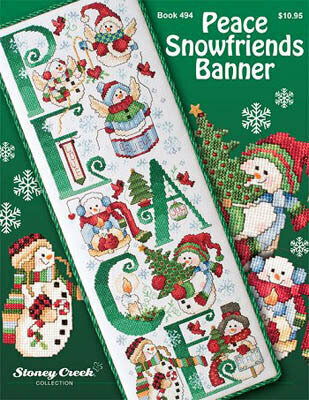 Stitch count 57x26. Model stitched over one thread on 25 Ct. Fabric with DMC floss. Stitch Count: 400W x 514H. Finished size over one on 25 ct fabric is 16" x 20 1/2". 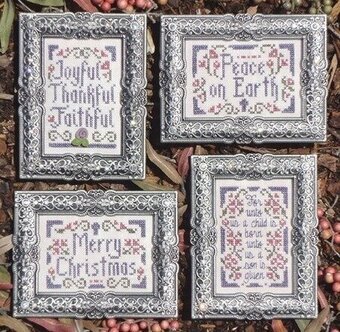 "Joyful Thankful Faithful" "Peace on Earth" "Merry Christmas" "For unto us a child is born, unto us a son is given" Models stitched on 40 count vintage chantilly creme by Lakeside Linens with Weeks Dye Works floss and a button from Just Another Button Company. 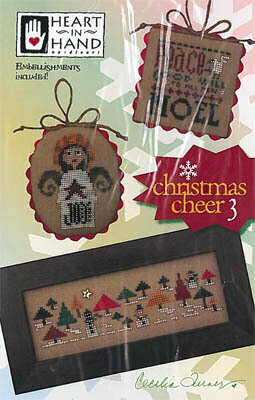 Stitch count for each ornament is 32 X 48. 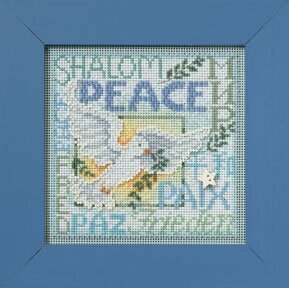 Kit includes 18 Ct. cream aida, muslin backing fabric, pattern, floss, ribbon, needle & instructions Finished size: 4" x 6"
Model stitched over two threads on 20 Ct. Blue Jeans linen by Weeks Dye Works with Caron Watercolours. 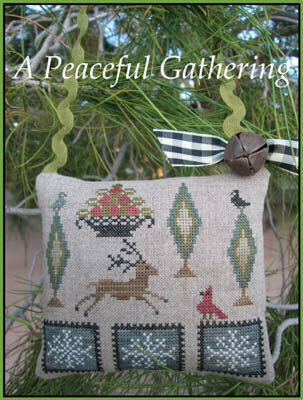 Stitch Count: 76x79. Comes with buttons. 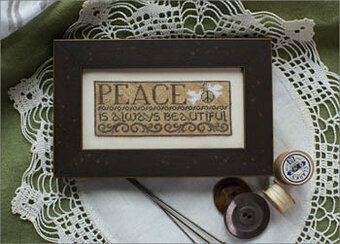 Model stitched on 36 count Cream Edinburg Linen with Gentle Arts Sampler Threads. 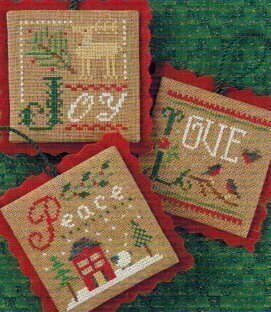 The stitch count is 99W x 59H. 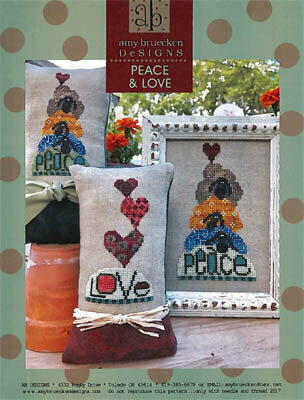 Book includes 5 patterns. 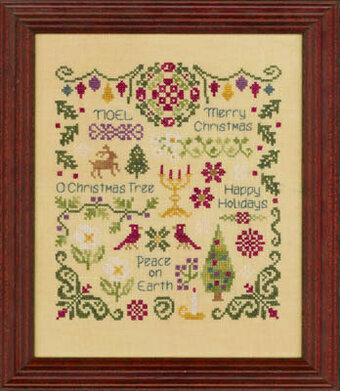 "Nativity Sampler Stocking" model stitched on 28ct. White Jobelan. 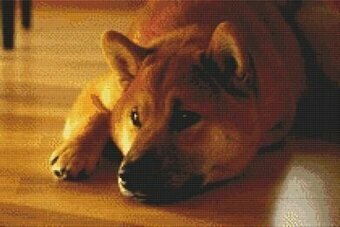 Stitch count: 154w x 243h. 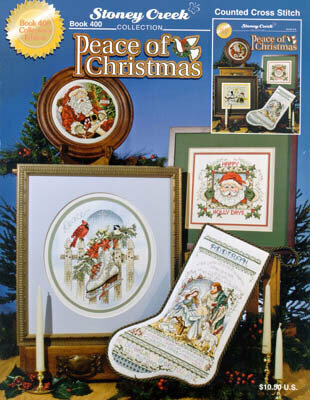 "Sleepy Santa Plate" model stitched on 28ct. 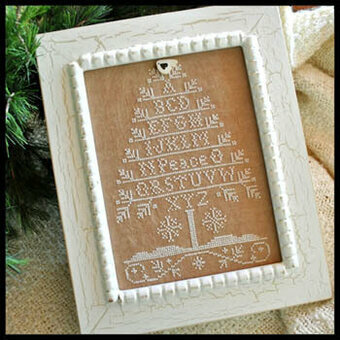 Antique White Jobelan. Stitch count: 100w x 100h. 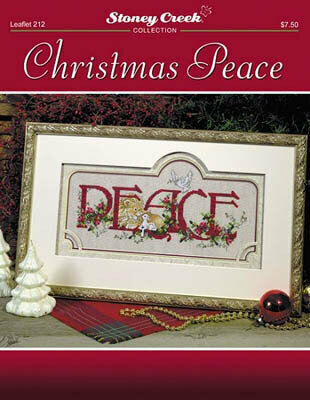 "Peace of Christmas" model stitched on 28ct. Clear Sky Stoney Creek Dyed fabric. 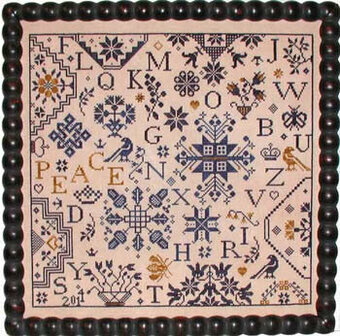 Stitch count: 126w x 151h. 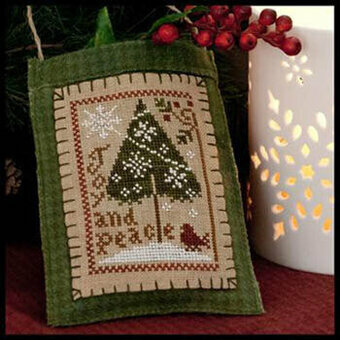 "Happy Holly Days" model stitched on 28ct. Antique White Jobelan. 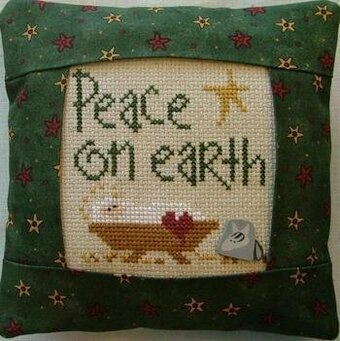 Stitch count: 111w x 99h. 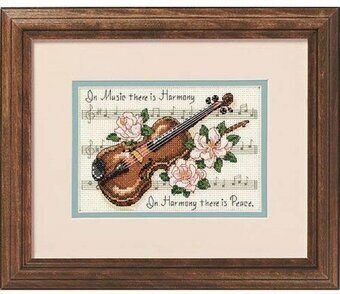 "Glory to God" model stitched on 28ct. Aged Ecru Stoney Creek Dyed fabric. Stitch count: 115w x 111h. All models stitched with Anchor or DMC floss. 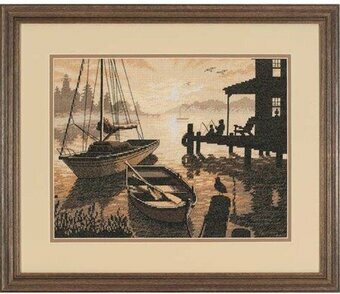 Model stitched on 35 Ct. Creek Bed Brown using Gentle Art Sampler threads. Stitch count 77x72. 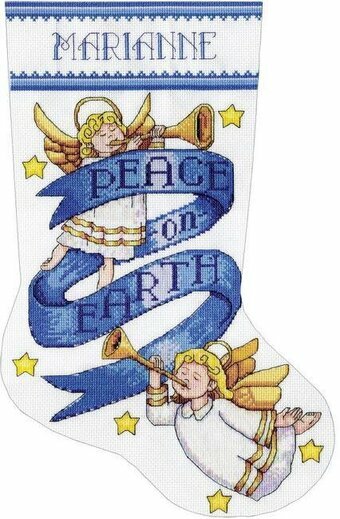 "Prince of Peace" "Wonderful Counselor" "For unto us, a child is born" Model is stitched on 40 Ct. Silk Gauze (NOT INCLUDED) Creamy white fabrics are good options for this design. 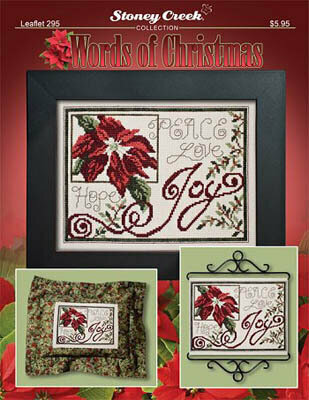 The smaller models are stitched on 40 Ct. Magnolia White Linen by Lakeside Linens, stitch counts are 42x50, 40x44 & 73x47. Floss used is Weeks Dye Works and DMC. 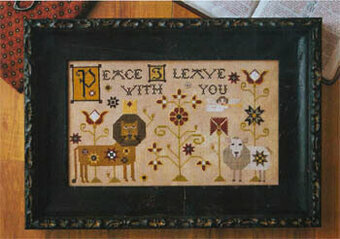 "Peace leave with you." Model stitched over 2 threads on 36 Ct. Vintage Meadow Rue linen with NPI Silks (or DMC 310, 610, 640, 646, 822, 950, 3011, 3046, 3787, 3829, 3857, Ecru). Stitch Count: 192W x 113H.